The big news of today is that Park Geun-Hye, the South Korean President, was impeached. We had received a warning from the US State Department about protests and possible violence, and family and friends at home sent us some messages expressing concern. 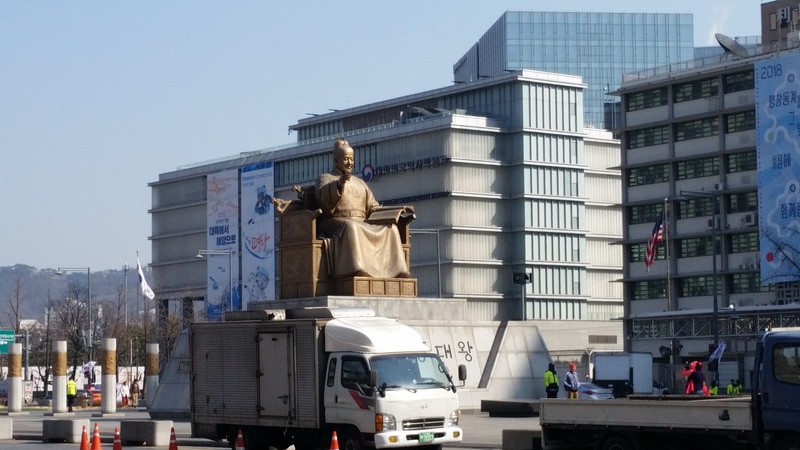 However, we stayed safe and were far enough away from the government center of Seoul that we didn’t even see anything except a somewhat-increased military presence in the city. 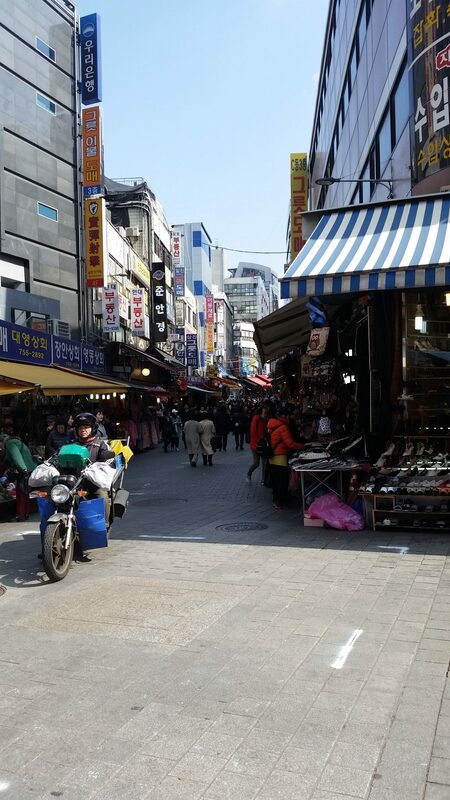 In the morning, we went to the main shopping area of Hongdae to look at new glasses. Grace had researched prior to the trip and found a number of people who had good experiences getting prescription glasses cheaply in South Korea and we decided that it would be good to try; my current glasses were a fairly old prescription (about 5 years) since I wear contacts all the time, and it was about time to get new glasses anyway. We had brought our prescriptions from recent eye exams in Seattle, so we didn’t even need to have an exam done. 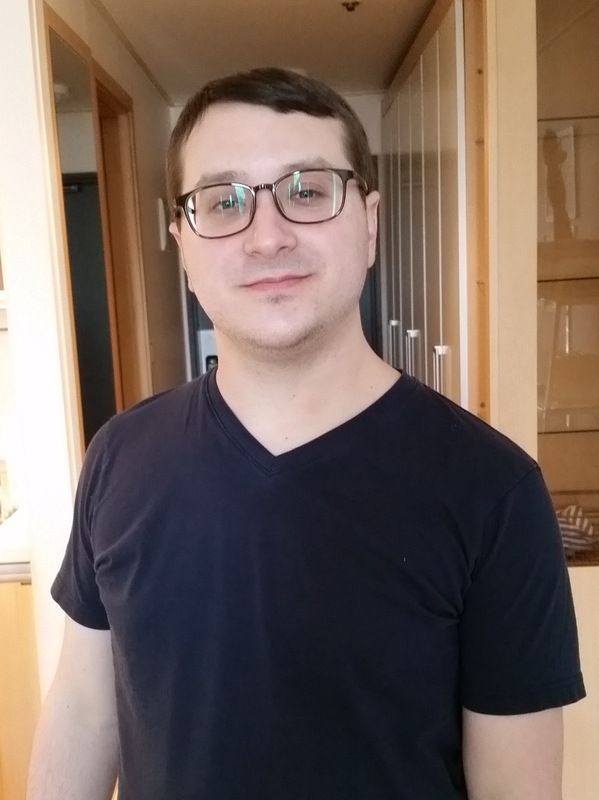 We ended up getting a few pair of glasses for an average cost of about $50 (frames + lenses); mine were slightly more expensive because my vision is fairly bad. We looked in the store for frames that would be nice, but I had a hard time; I think my face is a different size and shape than is typical in South Korea. However, the woman who was in the store was able to find frames that I ended up liking reasonably well. The glasses were ready quickly (they made them while we waited; took about 10 minutes) and they seem to have come out well, though they do have a fair bit more distortion around the edges than glasses I’ve had made in the US. Regardless, it’s pretty hard to beat $50 for prescription glasses. 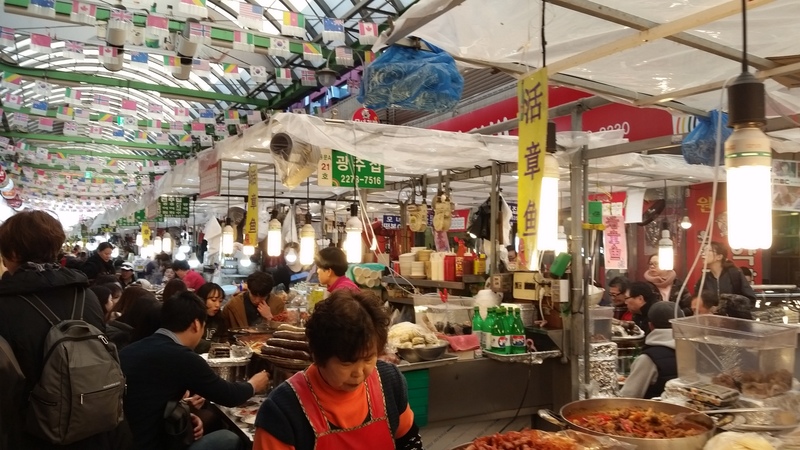 Once we got our glasses sorted, we went to Gwangjang market for some food. 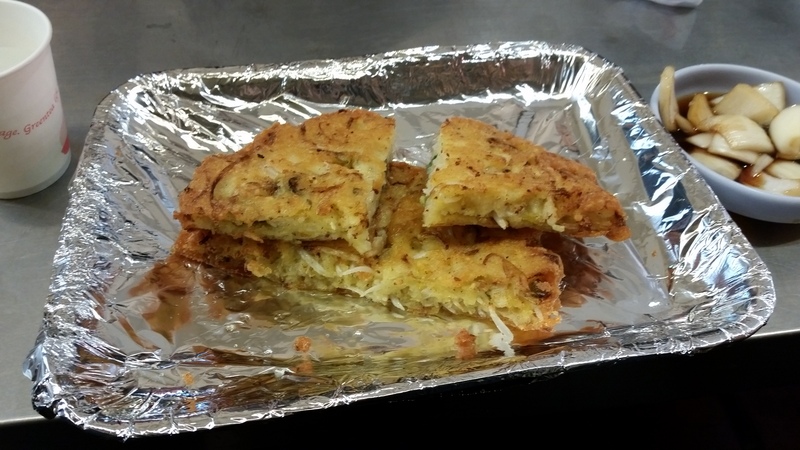 Gwangjang market is known for various styles of Korean pancakes, with mung bean pancakes being the most prevalent that we saw. We grabbed some pancakes and Grace also had some knife-cut noodles that she really liked. 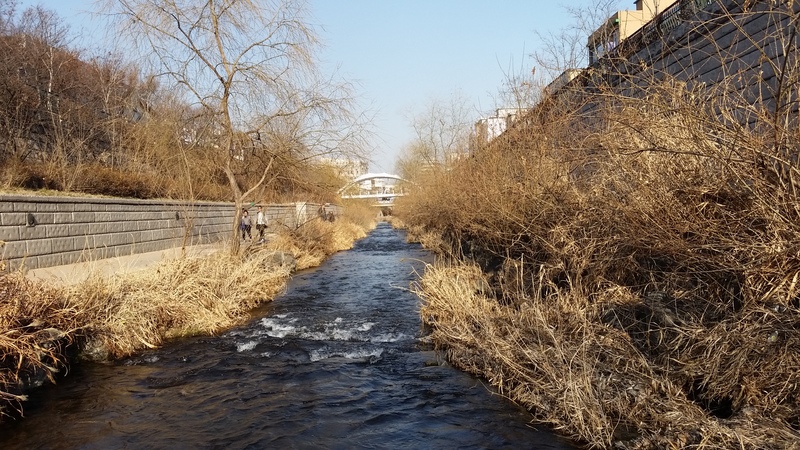 After finishing at Gwangjang, we walked to the nearby Cheonggyecheon stream. After a nice walk down the stream, we headed back to our AirBnB to rest. 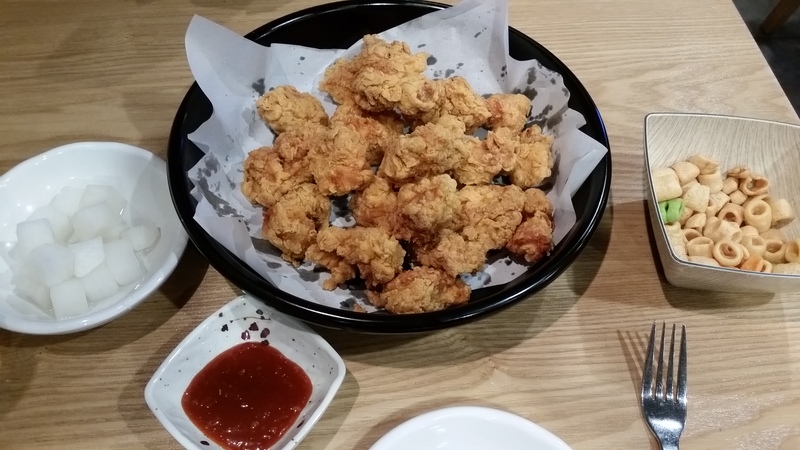 In the evening, we went out for Korean fried chicken and beer (called chi-mek: chicken and mekju) in Hongdae. 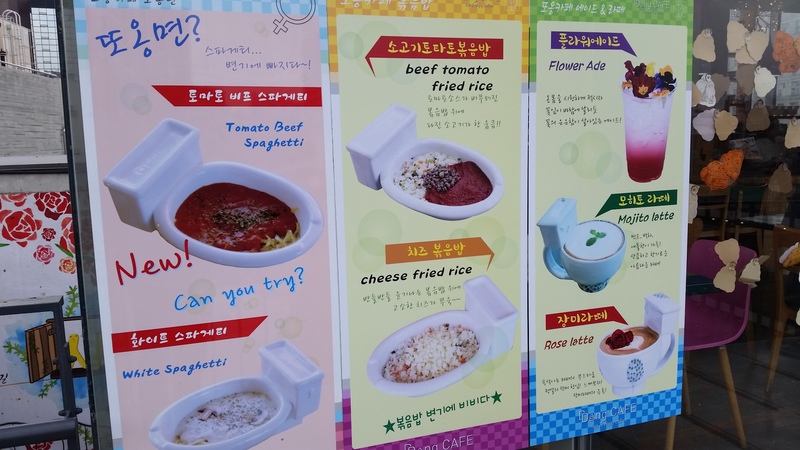 We went to a fairly tourist-friendly place, but the food was pretty good anyway. 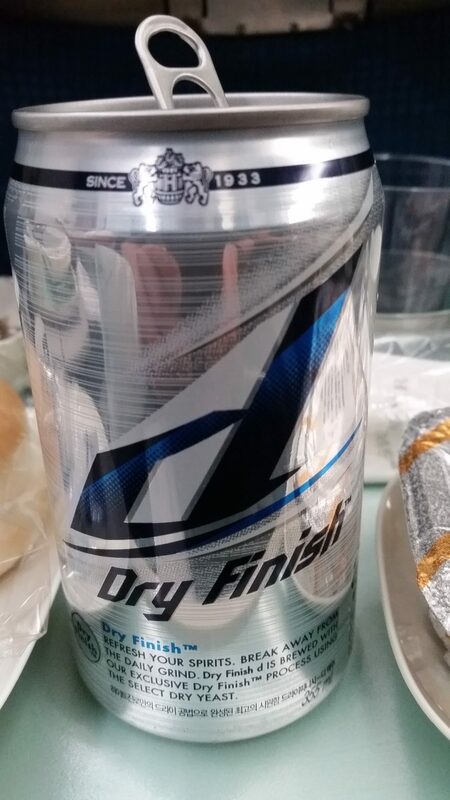 The beer tasted pretty similar to American-style lagers, which are not my favorite, but still paired pretty well with the fried chicken. After dinner, we left for Dongdaemun market. 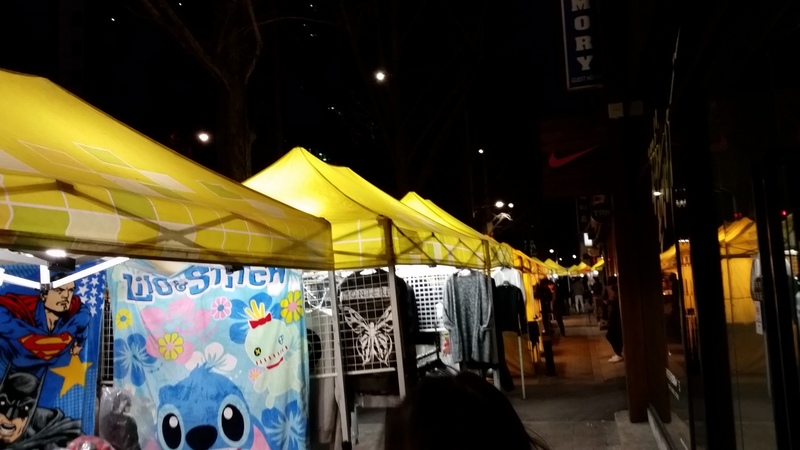 We went to the wholesale street tents that focused on fashion items like clothing and accessories; much of it counterfeit. 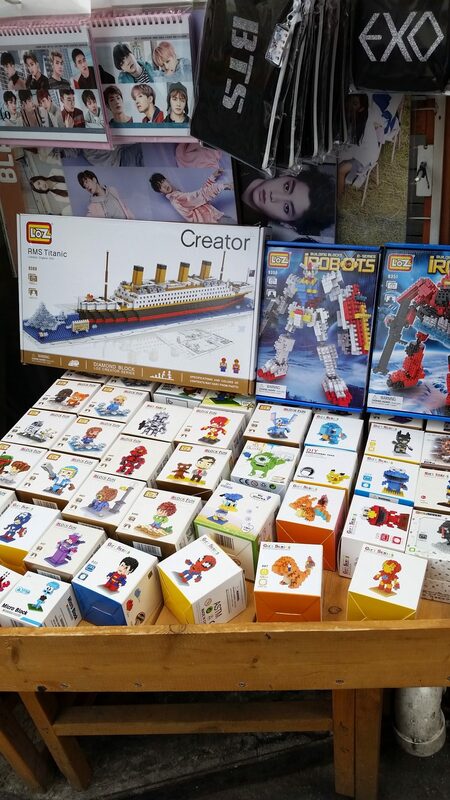 It was interesting to look at the goods and see if we could spot differences between what was being sold there and the genuine version. We were able to identify a few differences, but didn’t take any pictures as it wasn’t exactly easy to do inconspicuously. 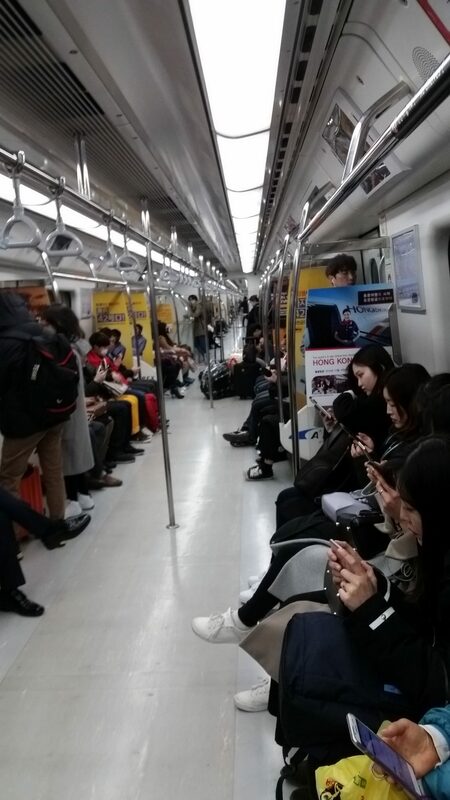 We got there around 10pm and left just after midnight, catching one of the last trains back to Hongdae. We woke up pretty late today and didn’t really get moving until almost noon. At least we were well-rested! 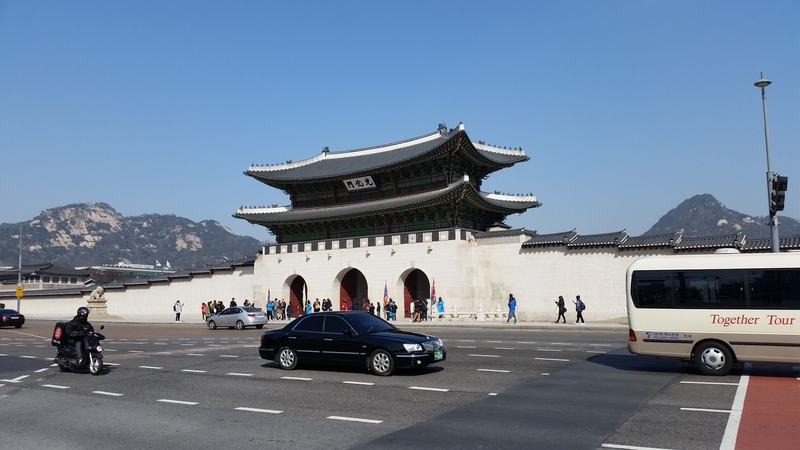 Once we finally got going, we left for Namdaemun Market. 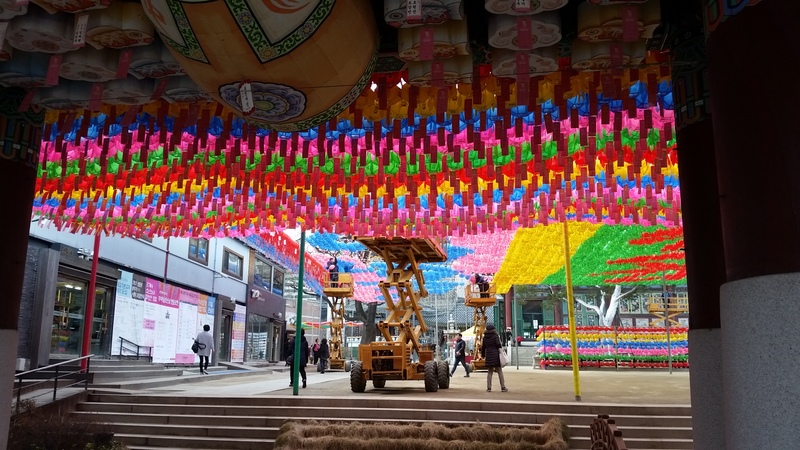 Namdaemun Market is a really big, really old market that was filled with tourists and vendors hawking their wares. We walked around for a while so Grace could see if anything caught her eye and so we could get a sense of what street food was available. Grace ultimately bought a few things, but I didn’t really buy anything other than food. 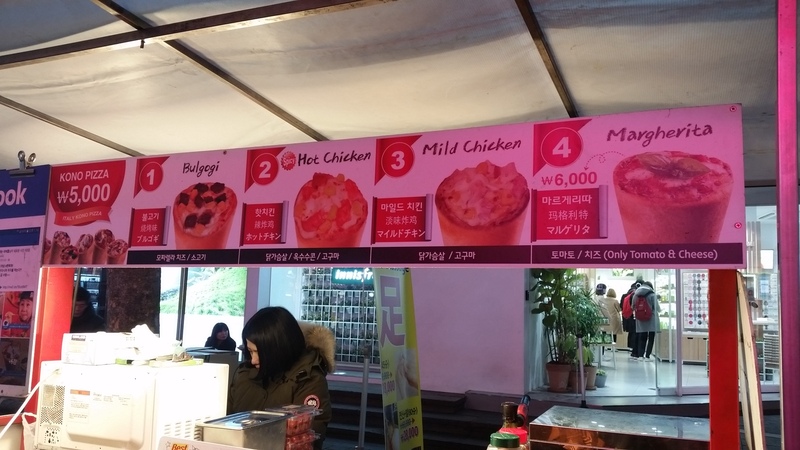 We then got some dumplings, donuts, and hoddeok as well as a sweet potato latte to drink. 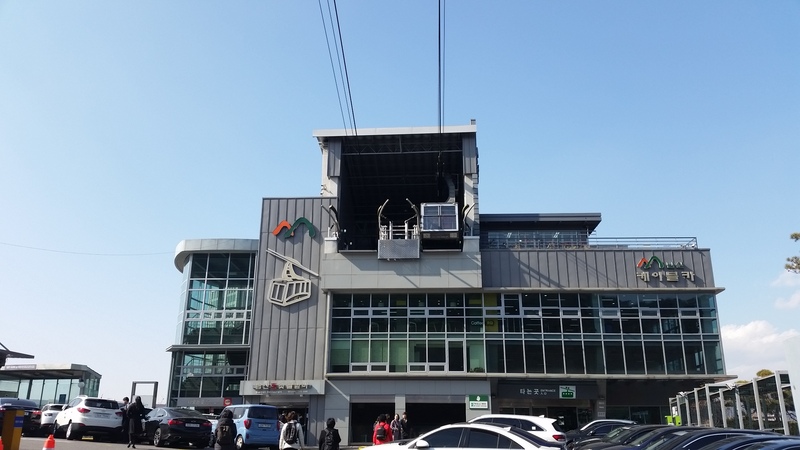 When we finished at Namdaemun Market, we left for the N Seoul Tower, a large radio tower on the top of Namasan Mountain. 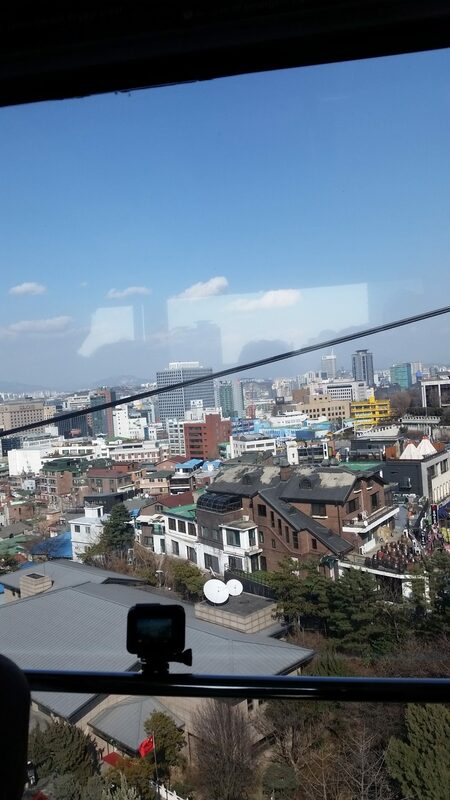 Because it was at the top of a mountain, we took the Namasan cable car up to the top. 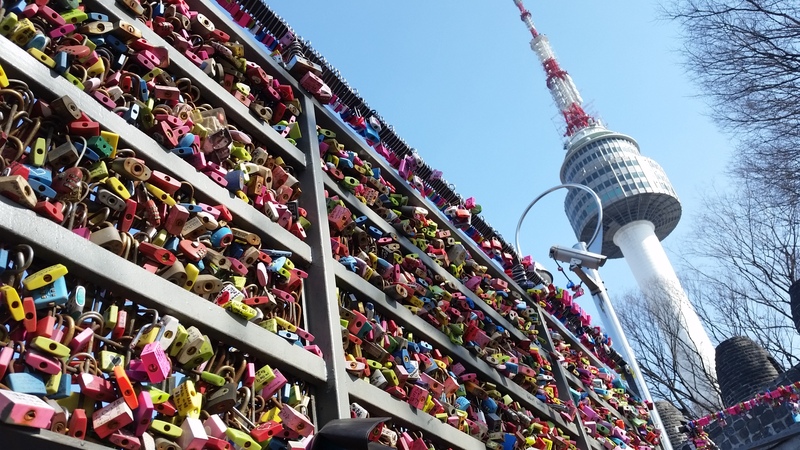 Apparently there’s a tradition of leaving love locks at N Seoul Tower, so along with the great views of the city we saw a lot of locks on the fences and sculptures. 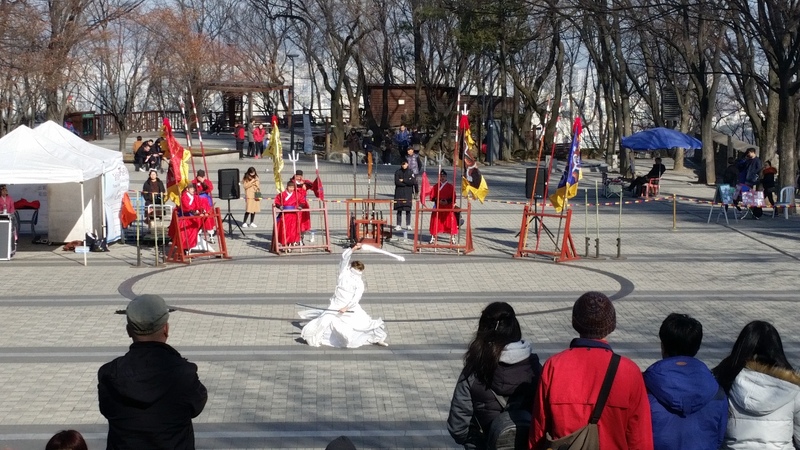 There was also a performance group at the top of the mountain performing, so we saw some demonstration of traditional Korean martial arts. We then walked down the mountain instead of taking the cable car. It was pretty, but also fairly long. By the time we got to the bottom we were fairly tired and decided to scrap the rest of our plan for the day and head somewhere closer to our AirBnB so we wouldn’t have far to travel. 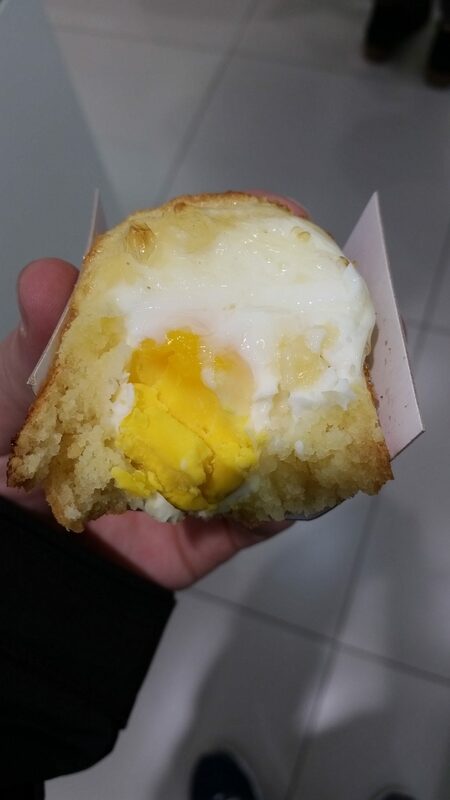 We ended up walking to two department stores to look at the food options: Shinsegae and Lotte. 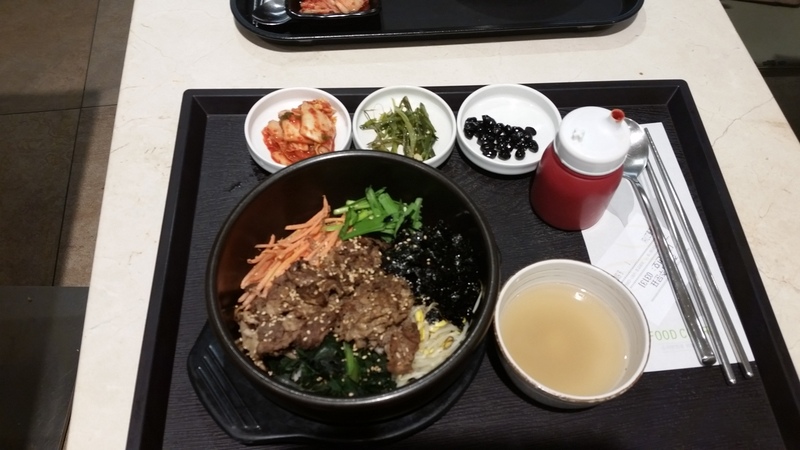 We ended up in the Lotte food court; Grace got a spicy sujebi dish and I got bibimbap. 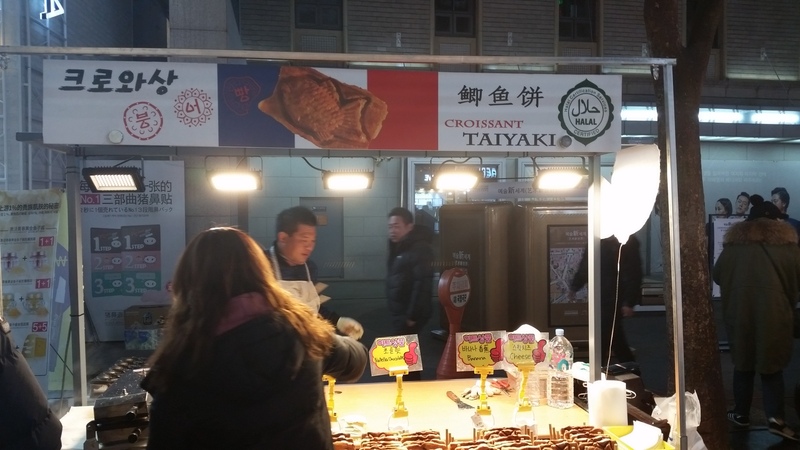 We also got some fried dumplings from a different stall in the store. After dinner, we went to one of the bakeries and got some baked goods. We then headed back to the AirBnB to rest for a bit before venturing out again. 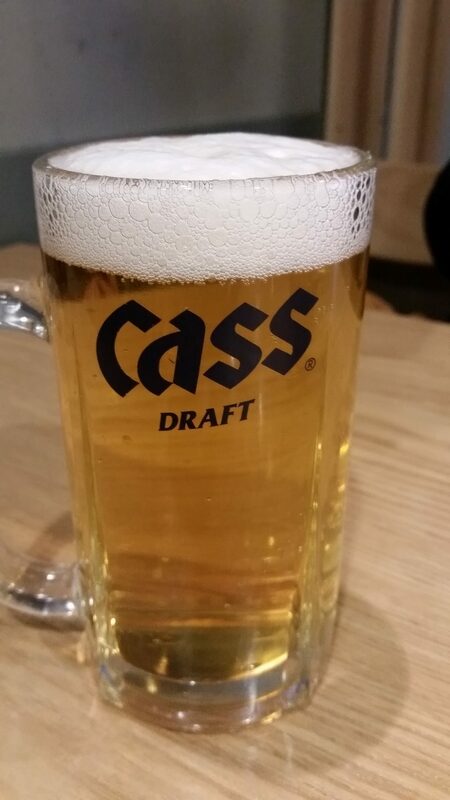 Once we decided to head out, we went to walk around the Hongdae area and look for stores to buy glasses. We came across a few street performance groups that were “dance busking”; they looked like college students. That ended our night. Tomorrow is Day 5! Today we woke up a bit later than the prior day, since we didn’t actually need to be anywhere at any particular time. 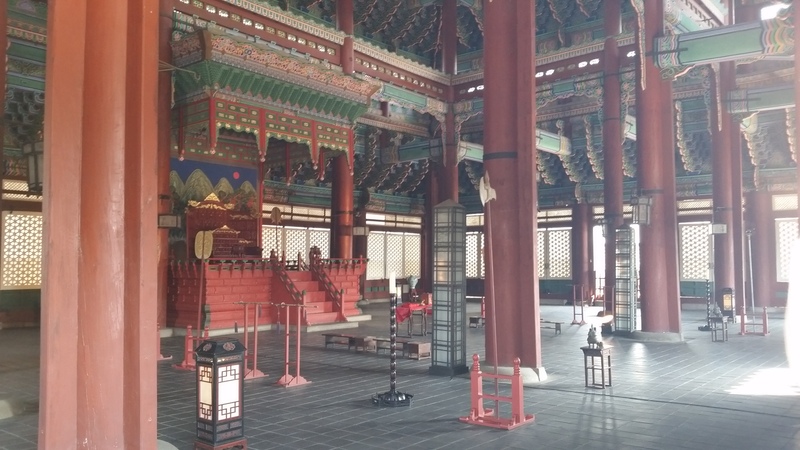 Our agenda for the day included a morning focused on Korean history and an afternoon/evening of exploring Korean neighborhoods and shopping. 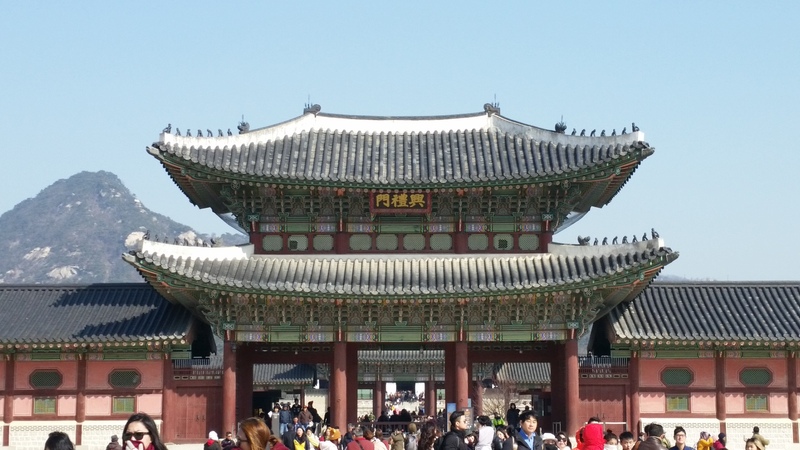 We left our AirBnB in Hongdae in the morning via subway and made our way to City Hall Station; from there we walked to Gyeongbokgung Palace. 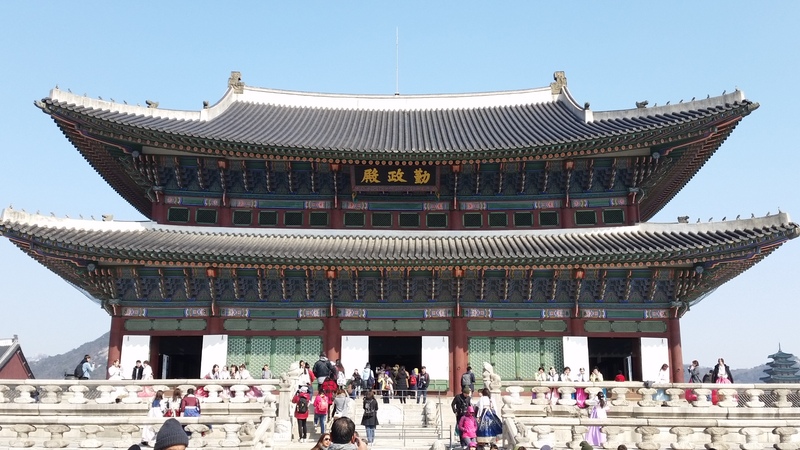 This palace was destroyed and rebuilt a few times, so it’s not exactly original but it is quite beautiful. 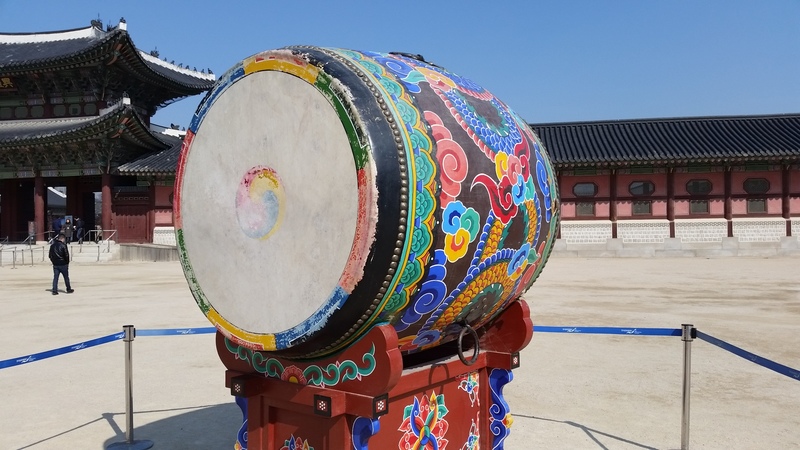 We wandered around the palace grounds for a while taking pictures, and then made our way to the National Folk Museum of Korea, which is located on the grounds of the palace. 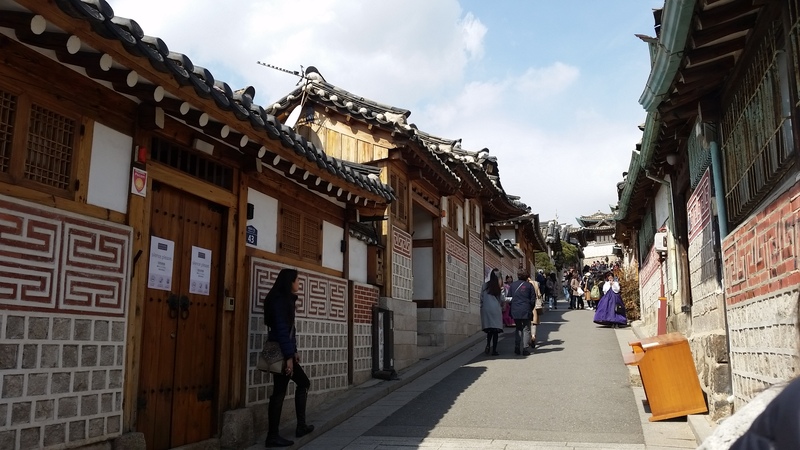 When we finished at the museum, we made our way walking to Bukchon Hanok village, a residential area with traditional Korean architecture. Bukchon Hanok village was clearly a residential area with people living there, as there were a number of signs admonishing tourists to be quiet. 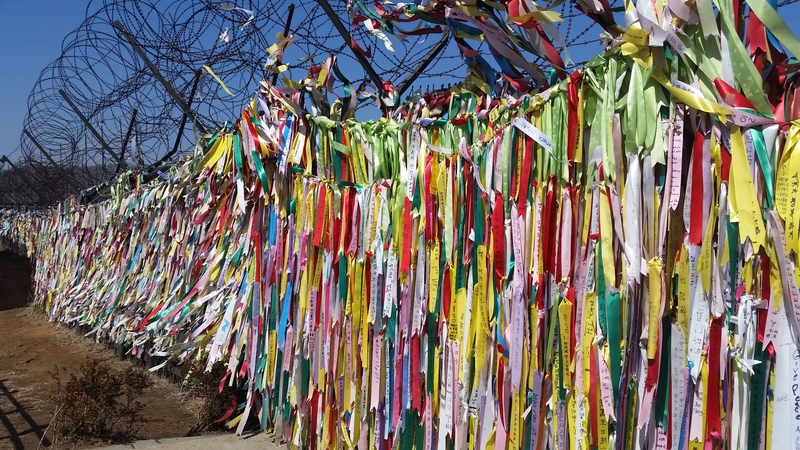 After leaving, we stopped to grab some Hoddeok to eat along the way to our next stop. 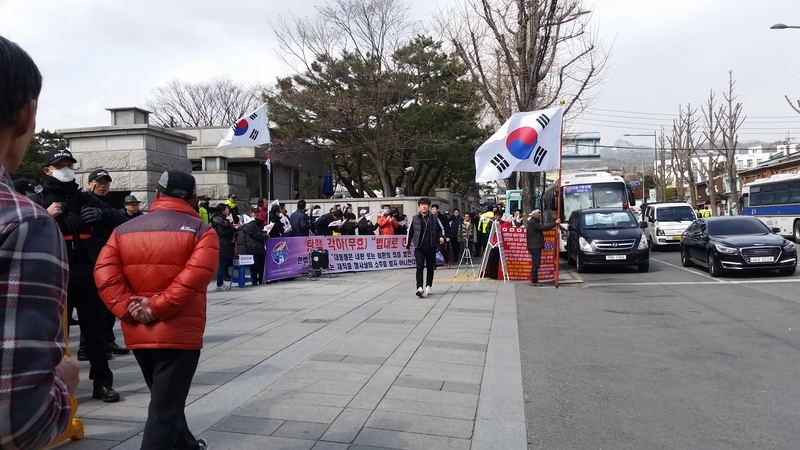 We also saw some protests outside that seemed to be related to the controversy with Park Geun-Hye. 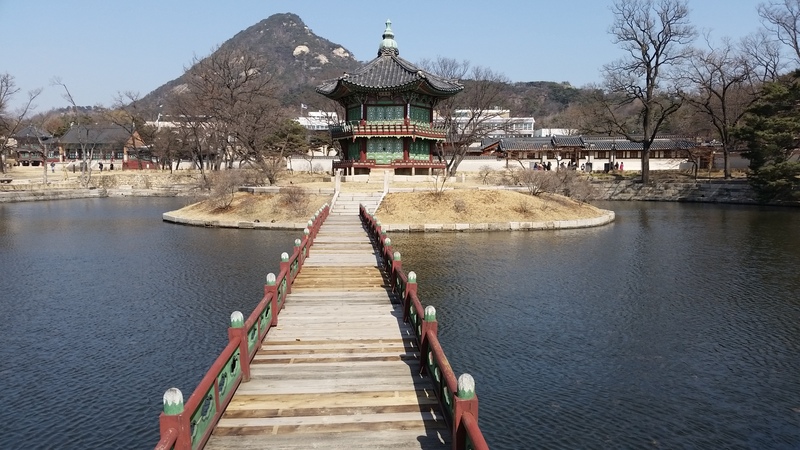 We then walked to Jogyesa Buddhist Temple. It looked like there must be some festival coming up, as many decorations were already in place and people were actively hanging more decorations (the internet claims that Magha Puja Day is March 12 of this year, but I don’t know enough about Buddhism). At this point it was about 1:30pm, so we made our way to Gyejeol Bapsang (a Korean buffet) for lunch in Insadong. 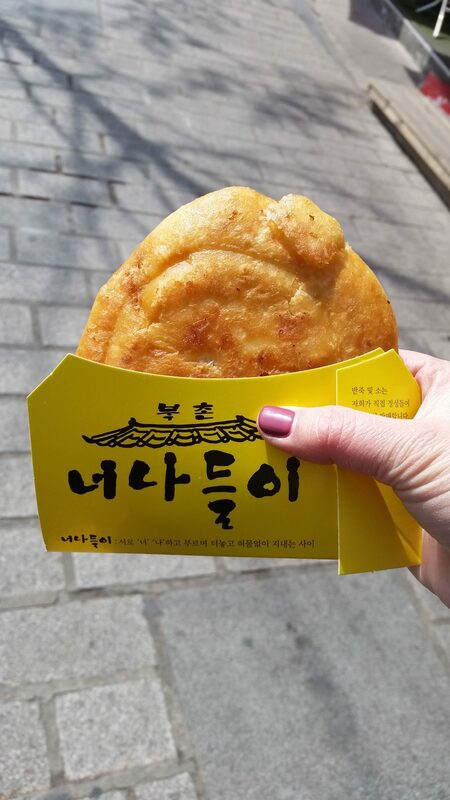 Grace had had Gyejeol Bapsang on a previous trip to Korea and really liked it, so that was a must-do on our itinerary. I thought the food was pretty good, though I mostly had various preparations of Chicken. Even though I was not trying to eat spicy food, it eventually caught up with me and my mouth was on fire. 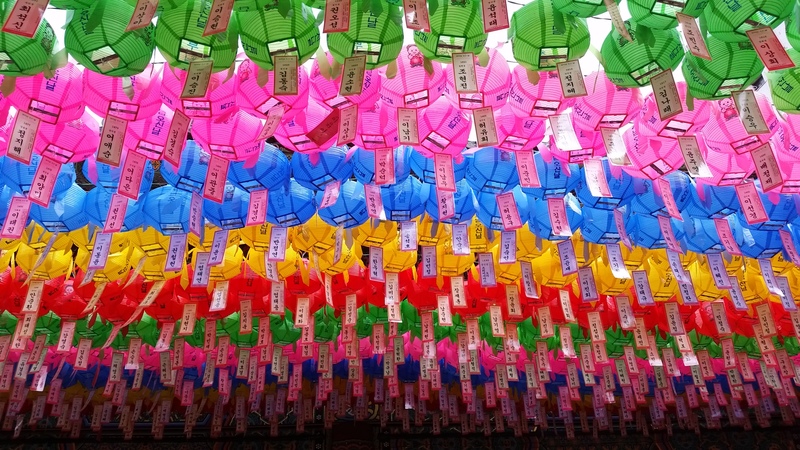 We left Gyejeol Bapsang quite full and proceeded to walk through Insadong to look at all the shops. We made our way back to the AirBnB to rest a bit, and then went to Myeongdong for dinner consisting of street food and for more shopping. 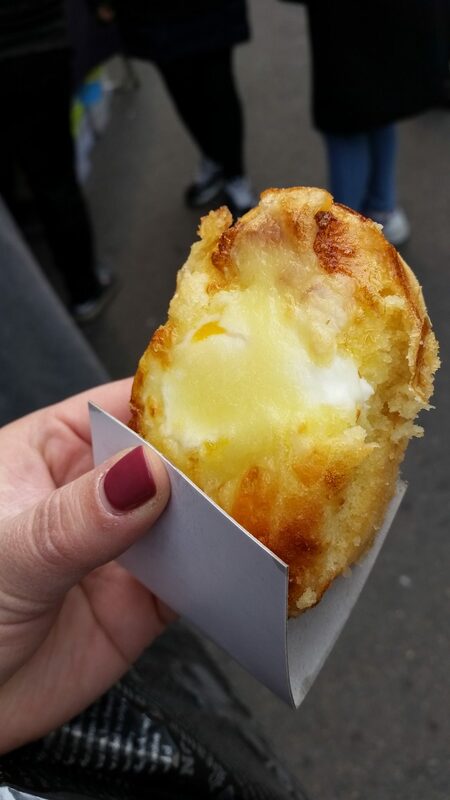 I had a pizza-cone thing (cheese and tomato sauce inside a dough cone; pretty good, if difficult to eat because the cheese was so stringy), an egg-bread thing, a hoddeok, and split a croissant taiyaki and spiral potato with Grace. Grace had a skewer of odeng (fish cake) and a bowl of jajangmyeon. We found a currency exchange place that Grace used on a previous trip and exchanged some cash (so I finally had cash of my own) and went into a bunch of skincare stores. After that we came home and went to sleep, ready for Day 4! 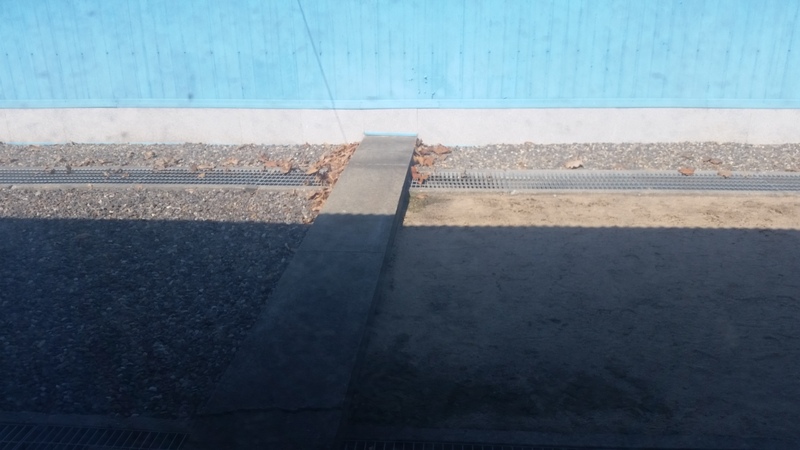 The big highlight of today is our tour to Panmunjom and the Demilitarized Zone. We woke up at 6:00 AM after about 8 hours of sleep (we had finally gone to bed around 0:00 PM the night before) and got ready to head out by 7:30. 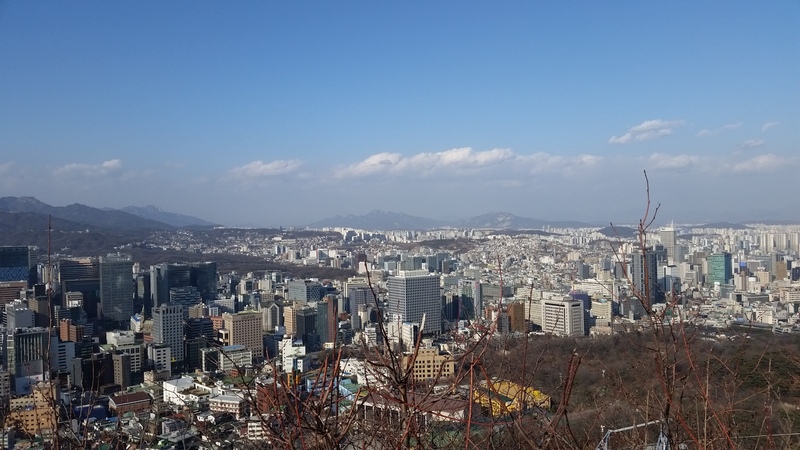 We went back to the subway station and caught Seoul Subway Line 2 to City Hall Station and then walked to the nearby Koreana Hotel from which our tour departed. 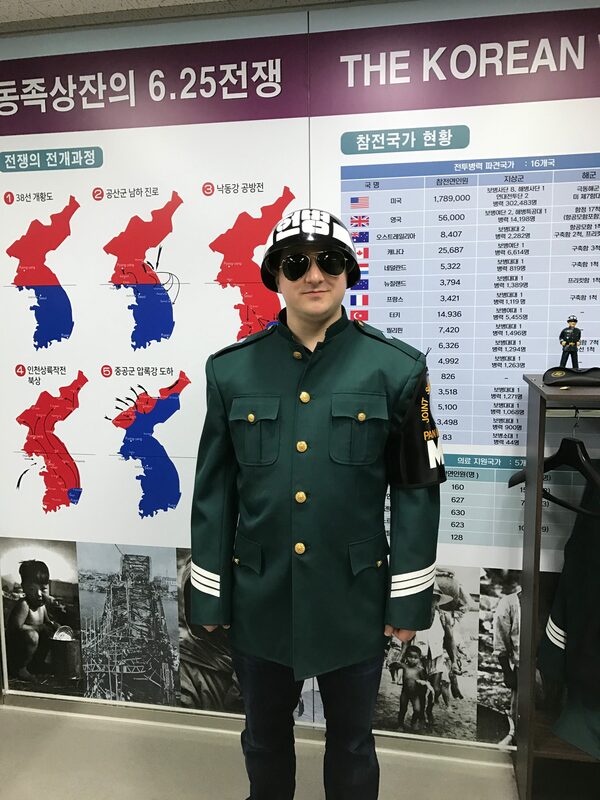 When we checked in, we got to try on some of the uniform elements of the ROK Army guards which made for a pretty goofy picture. 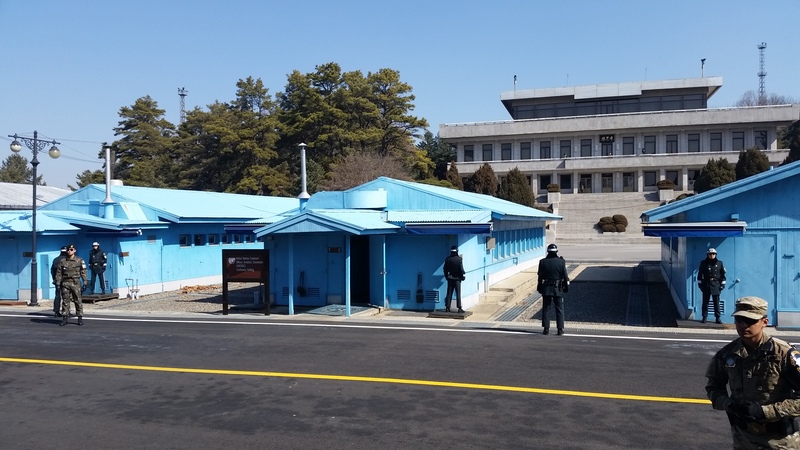 Soldiers from both sides patrol Panmunjom, but I only saw two North Korean soldiers out today. 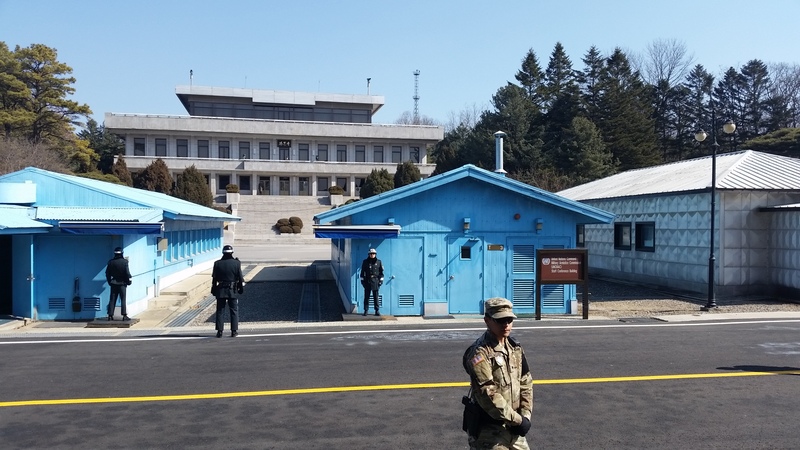 According to the US Infantryman who was guarding us, the North Korean soldiers really only come face-to-face with the ROK/UNC soldiers during high-level meetings or other VIP-type scenarios. 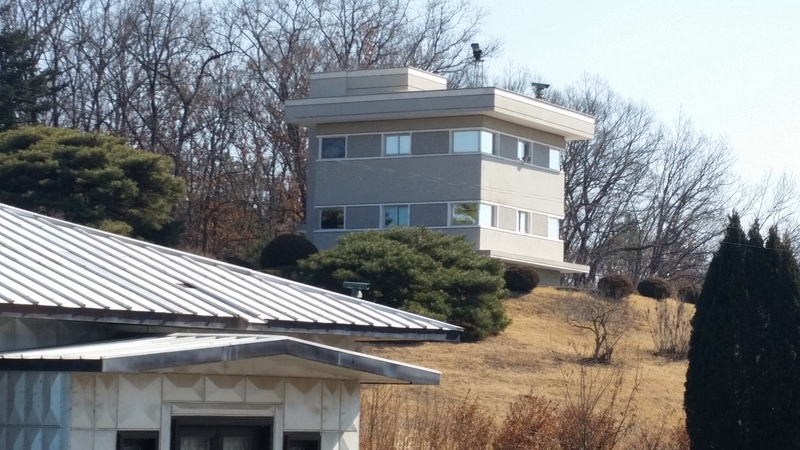 However, he assured us that they were watching us from their main building and their nearby observation post. North Korea’s Panmungak building, visible in the background behind Buildings T-2 and T-3. 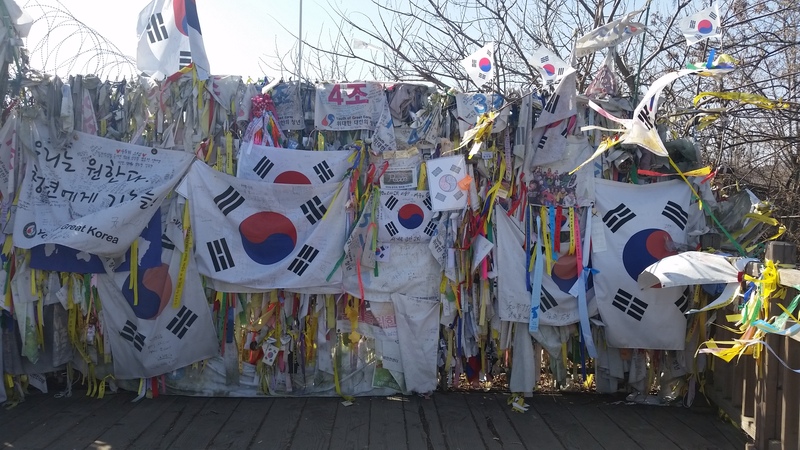 After spending only a few minutes at Panmunjom, we departed and went back to the visitor center in Camp Bonifas so we could visit the gift shop and head toward Imjingak park to look at monuments to the war. Freedom bridge, on the left. It’s now a train bridge, but was originally a pedestrian bridge. We then left for lunch at a local restaurant. 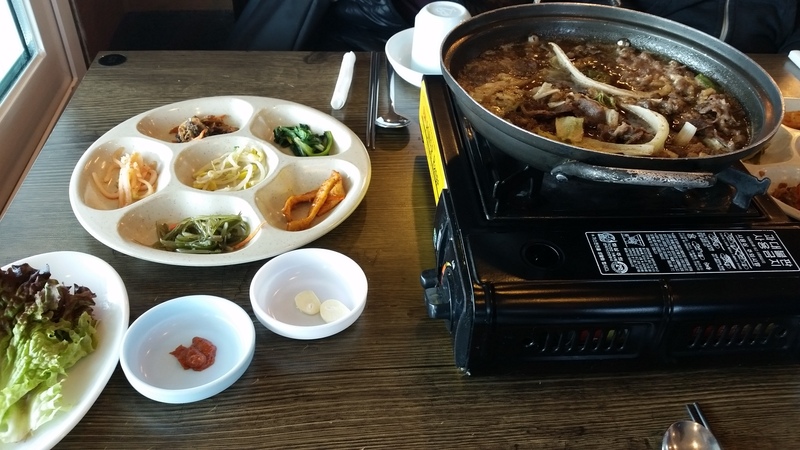 They served beef bulgogi, and it was decidedly not the best bulgogi that I’ve had. Neither Grace nor I finished it. Our next stop of the tour was the top of the mountain at Dora Observatory. 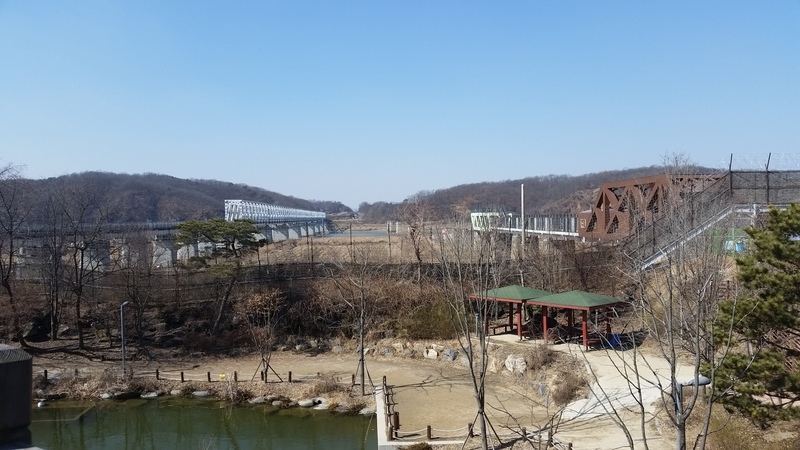 From here, we could see both Tae sung dong village (South Korean village inside the DMZ) and a North Korean propaganda village. We could see both gigantic flagpoles (South Korea’s is 100m tall, North Korea’s is 160m tall) and hear the propaganda being broadcast via loudspeaker from North Korean territory. Our final stop on the tour before heading home was Dorasan Station, a train station within the CCA that serves as the last station before North Korea. 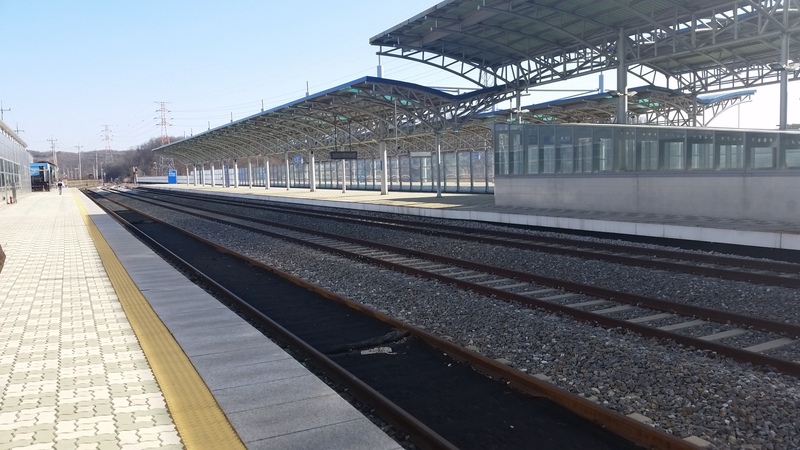 Trains used to run to the Kaesong Industrial Region prior to increased tension between the countries; now it’s just the terminus of trains in South Korea. 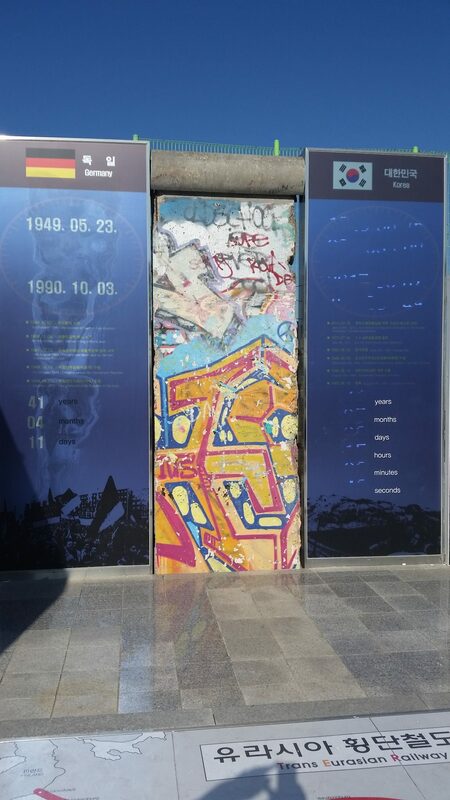 A piece of the Berlin Wall was donated to Dorasan Station and stands as a monument to strife created by building walls between people; the Berlin Wall stood for 41 years and the separation between two Koreas has endured for 71 years so far. 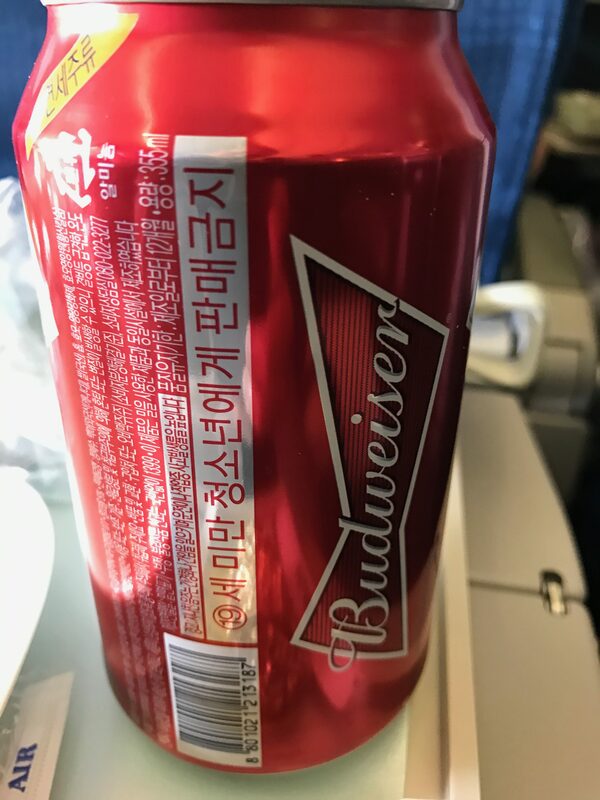 On our way back to Seoul, we got to ask questions of a North Korean defector who had been on the tour with us. She told us of her escape and her struggle, and of her family that is still in North Korea without any means of contact. It’s really crazy to hear what a different world it is inside the hermit kingdom. One of the overarching themes of the day was reunification. 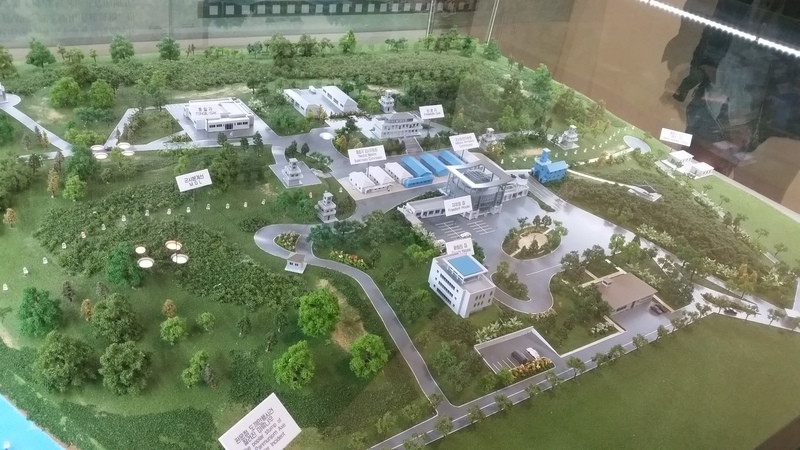 I didn’t realize before coming here (and especially before taking this tour) how much some people really hope for the end of the North Korean regime and for civilians to be reabsorbed into society. The extent to which families have been divided by this conflict is pretty immense. 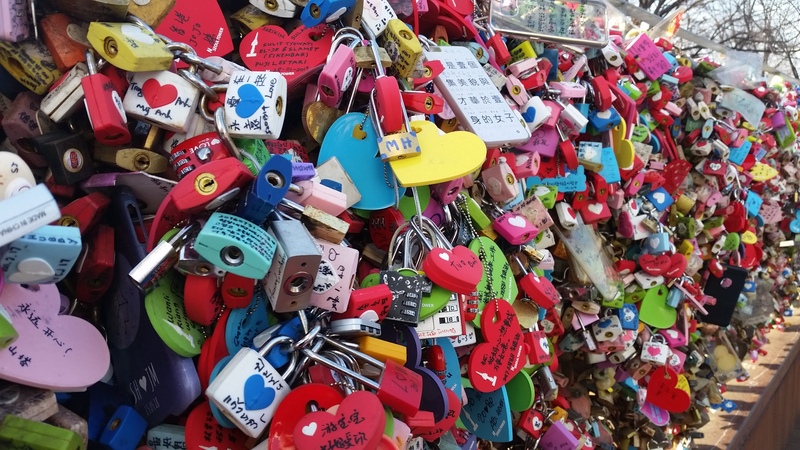 However, my opinion on this hasn’t really changed; I don’t see a path to reunification while the Kim regime stands and I believe it’s going to be an extremely long and difficult process if it ever does come to pass. Grace and I went back to our AirBnB to rest after a long day. 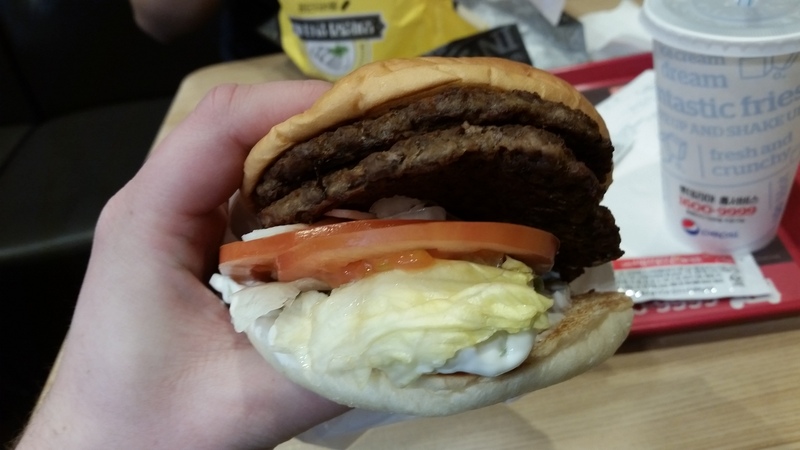 By the time we started feeling better, it was already getting late for dinner. We debated where to go and settled on trying to go somewhere close. 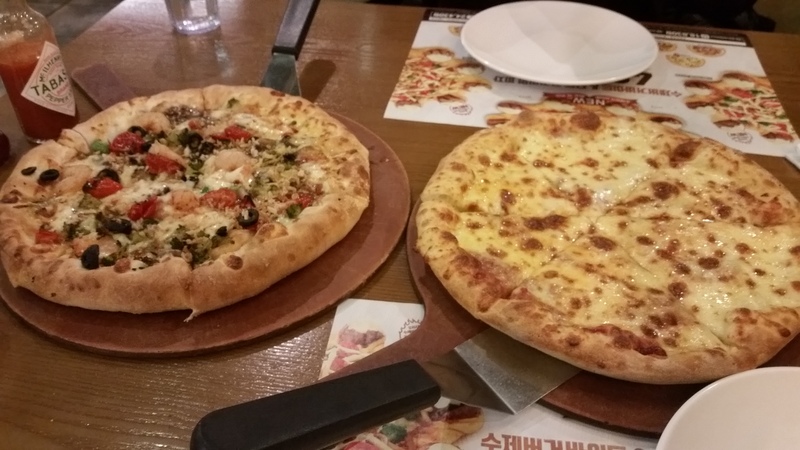 Looking online, we thought that a Mr. Pizza (South Korean pizza chain) was nearby, but we couldn’t find it when we walked to the address we found. We then found another address, and it wasn’t there either. We ended up at Pizza Hut, which was a much nicer sit-down restaurant than I’ve seen in the US, though the food was fairly similar to pizza in the US. 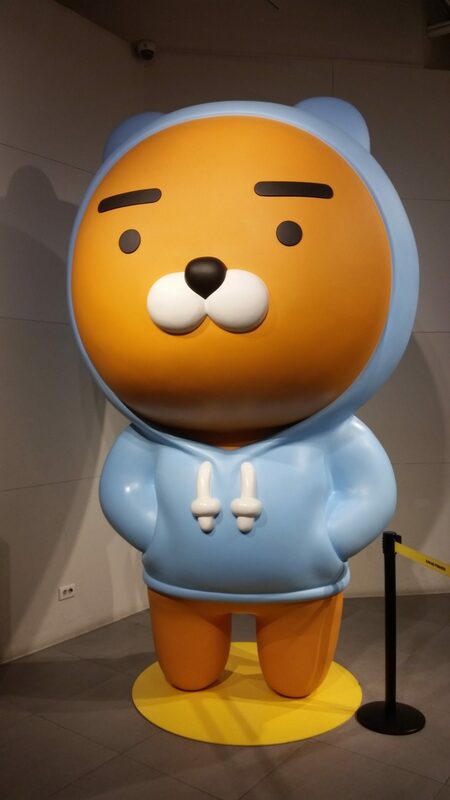 Along the way, we discovered a Kakao Friends store that Grace wanted to visit, so we went there on the way back. 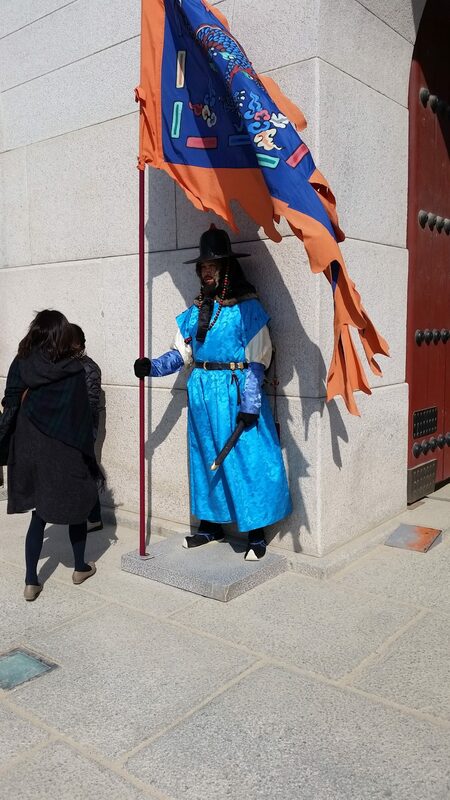 Today, we discovered that Google Maps works really poorly in Seoul; according to an old friend who now lives here, this is because the South Korean government restricts the information that can be seen to try and reduce the risk of attack on the city. I’m hoping that we have better luck with it tomorrow; it’s really inconvenient as a tourist to not be able to have good directions on your phone. 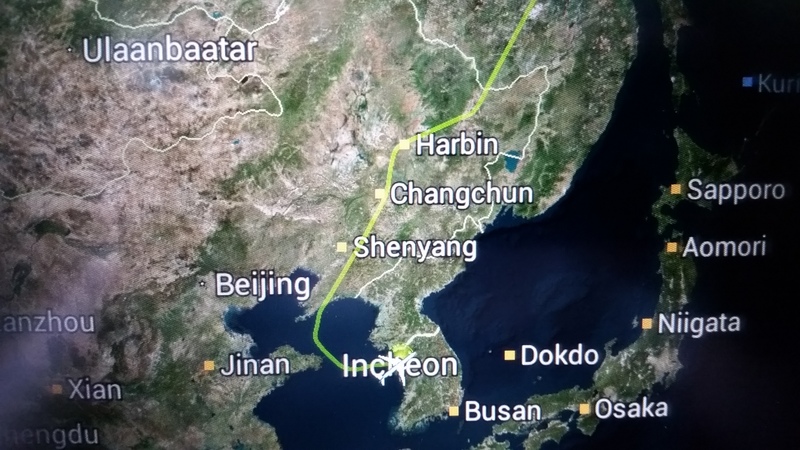 As we were getting close to Korea, I noticed that the flight path was deviating from what the seat-back map had predicted. Instead, it looked like we veered to head toward Beijing. 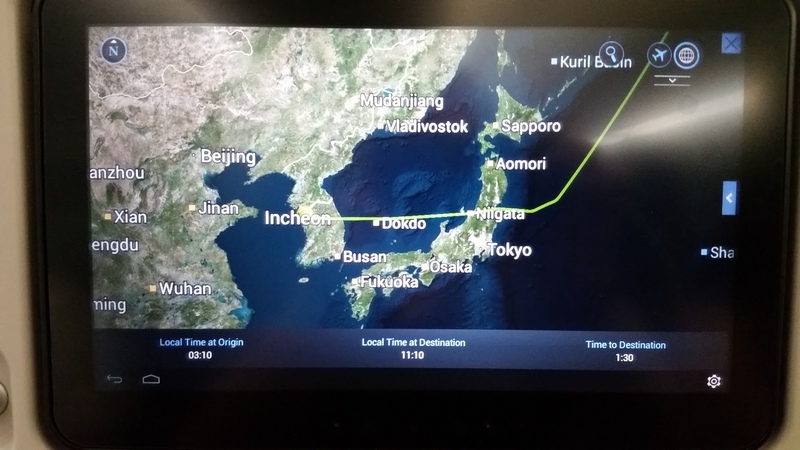 As we got closer it became clear that we were just steering clear of North Korea’s airspace. 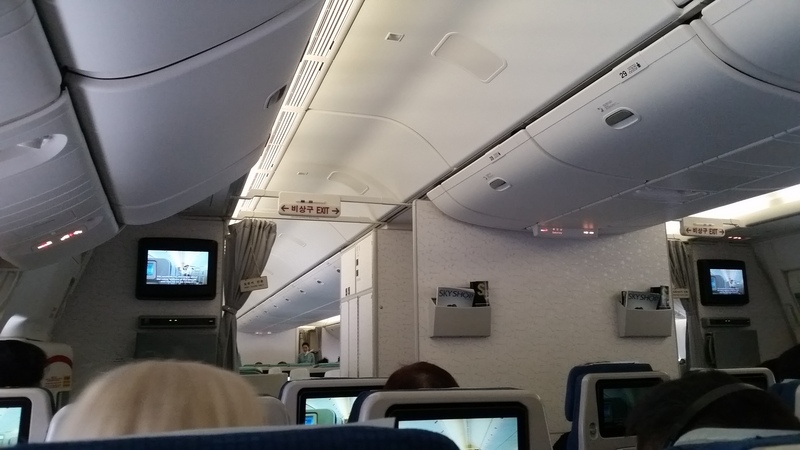 We landed at Incheon at about 5:45pm local time. We managed to get off the plane fairly quickly, grab the first shuttle to the main terminal, and get through both immigration and customs in pretty much record time. We then found the place to pick up our wifi hotspot for the week, and went down to the train. We thought that we needed to take the A’REX Express train and bought tickets for that. After we got on, we realized that he Express train skipped the station we needed to go to for our AirBnB. We rode all the way to Seoul Station, got off, bought new tickets for the regular A’REX and finally made our way to Hongik University Station in Hongdae. After wandering around for a few minutes, we found the AirBnB building, grabbed our key, and made our way to it. We went out a bit more to grab some supplies (bottled water and something for breakfast), then came back to unpack, shower, and sleep. 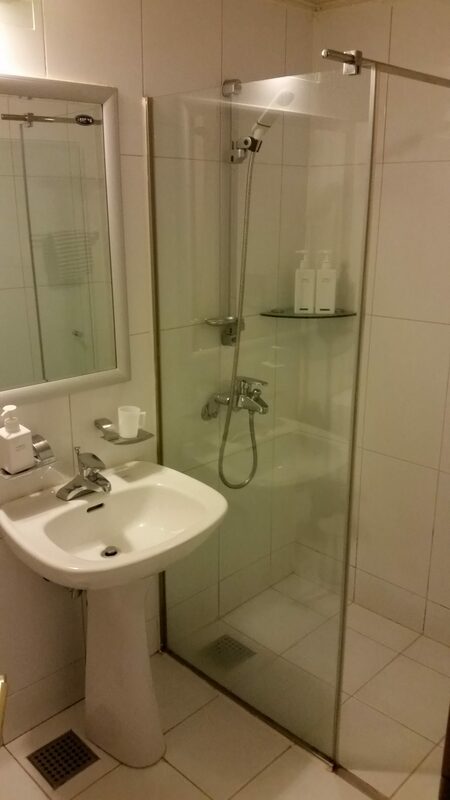 The shower is a bit different from what I’m used to; the floor is pretty much level with the rest of the bathroom so water gets everywhere and you need to wear sandals inside. Aside from that it was a pretty normal shower though. It’s very late now (by Seattle time), so I think we’ll turn in and get some sleep before our tour tomorrow morning. 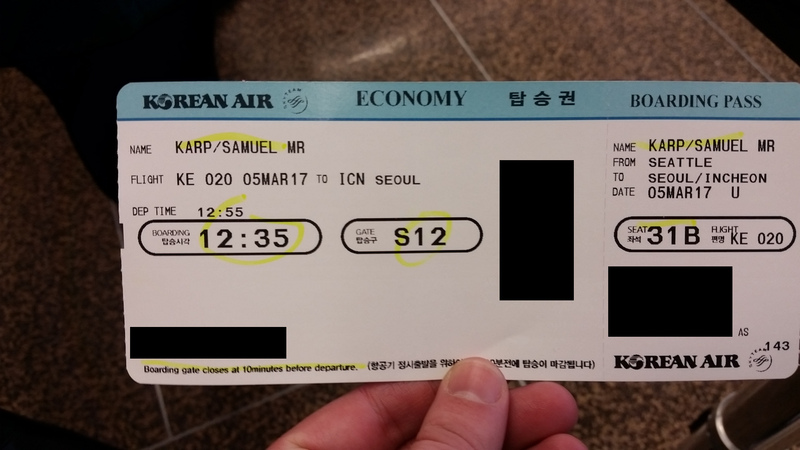 It’s Day 0 of my next international jaunt, this time to Seoul, South Korea! I’m super excited to go on another vacation and visit a country I’ve never been to (and a new continent, depending on whether you categorize Israel as part of Asia or not). This time, I’ll be traveling with my girlfriend Grace and doing a mostly fluid trip; we’ve planned our own trip this time instead of going as part of an organized tour. All we really have concretely planned are our flights, our lodging, and a tour of the demilitarized zone with North Korea. This is going to be a week of new experiences for me. I haven’t spent much time in a where I don’t speak the language, and this time it’s going to be a language that doesn’t even share an alphabet with a language I know; at least Grace can translate. 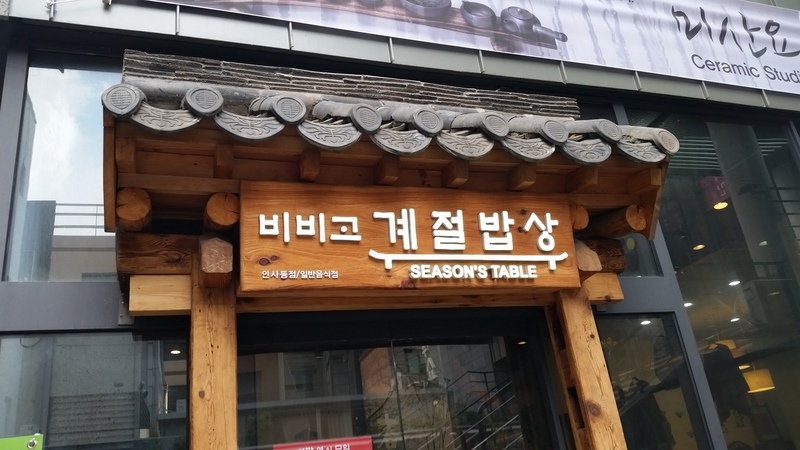 I’m also still a novice to Korean cuisine, so I expect to try new things and hopefully have a great time. 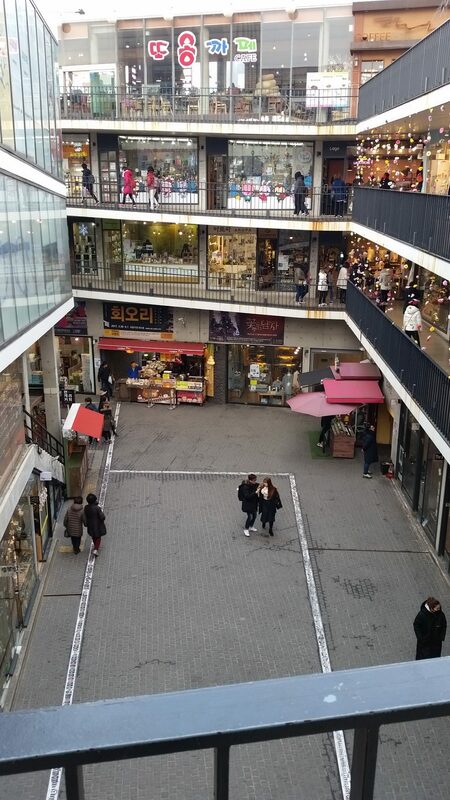 We’re staying in an apartment in Hongdae, a neighborhood in Seoul near Hongik University. 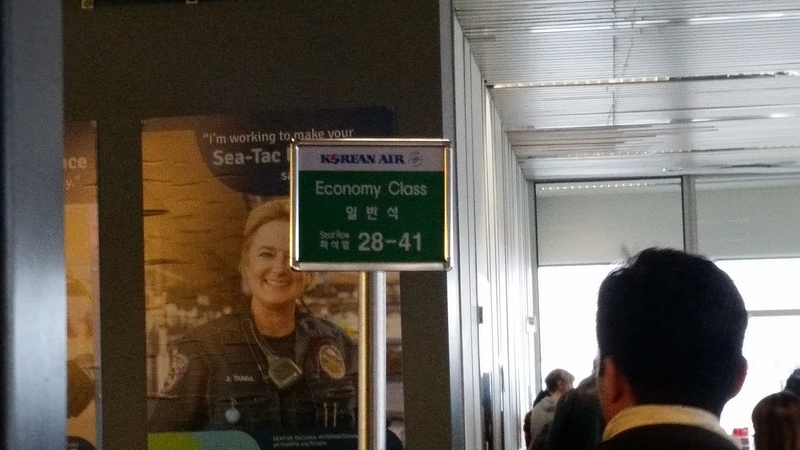 We arrived at SeaTac around 11 AM and checked in at Korean Air. They had some restriction on purchase such that they needed to “verify” the credit card used to purchase the tickets, so we checked in at the desk. We had talked about switching seats to have an aisle, but the only available aisle seat adjoining a middle seat was farther back in the plane than we wanted to sit. We kept our windows + middle seat assignments (Grace gets the better seat). Departing on an international flight from SeaTac is a bit different from other airports I’ve used when leaving the country; there’s no separate international terminal, so it’s very much like getting on a domestic flight. Once it was time to board, we got on the plane. It turned out that there were some empty seats, so the gentleman who was sitting next to me moved over to the middle of the row and we both got an empty seat next to us. This was super lucky and convenient because it meant that I could stretch out more and that neither Grace nor I would need to bother a stranger if we needed to use the restroom. 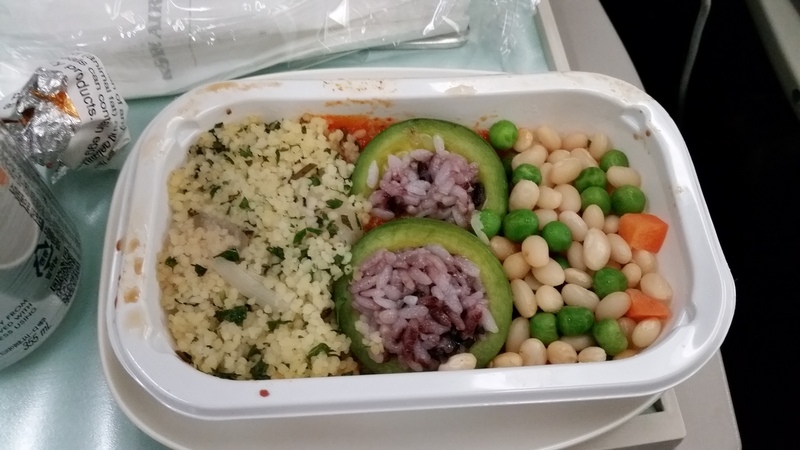 I ordered vegetarian meals for both flights. 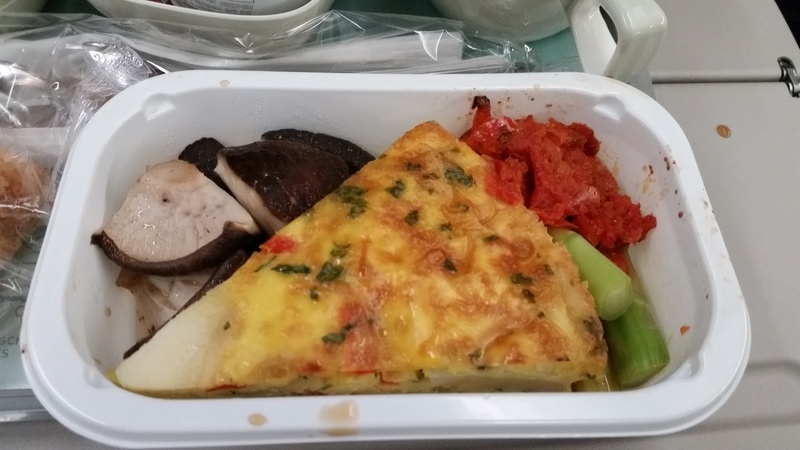 This flight, we got served two meals and a snack of brownies in the middle. 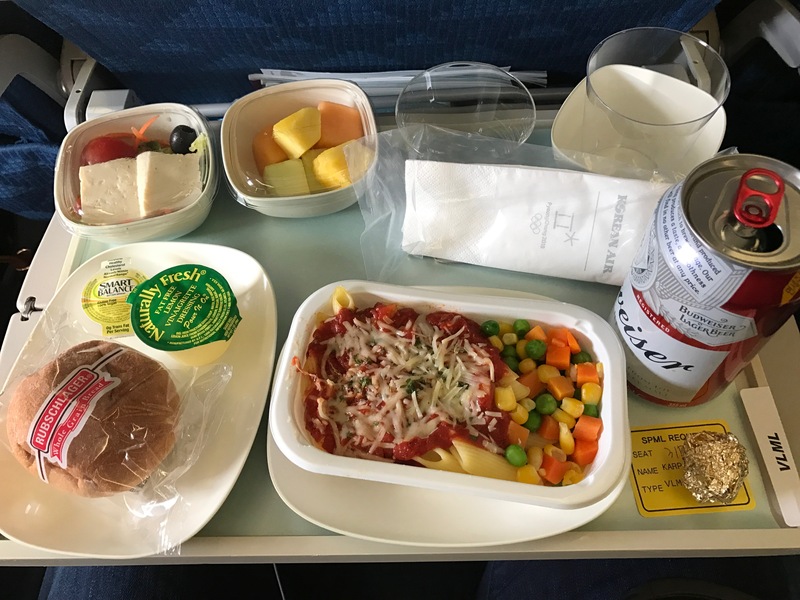 The first meal for me was a vegetable pasta with tomato sauce, peas, and carrots accompanied by a salad with tofu and a roll. 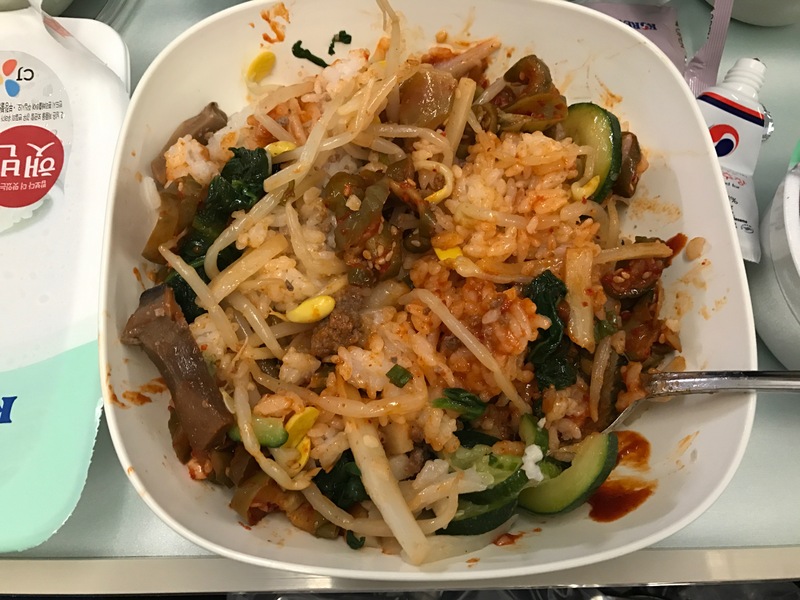 Grace’s first meal was bibimbap with beef. 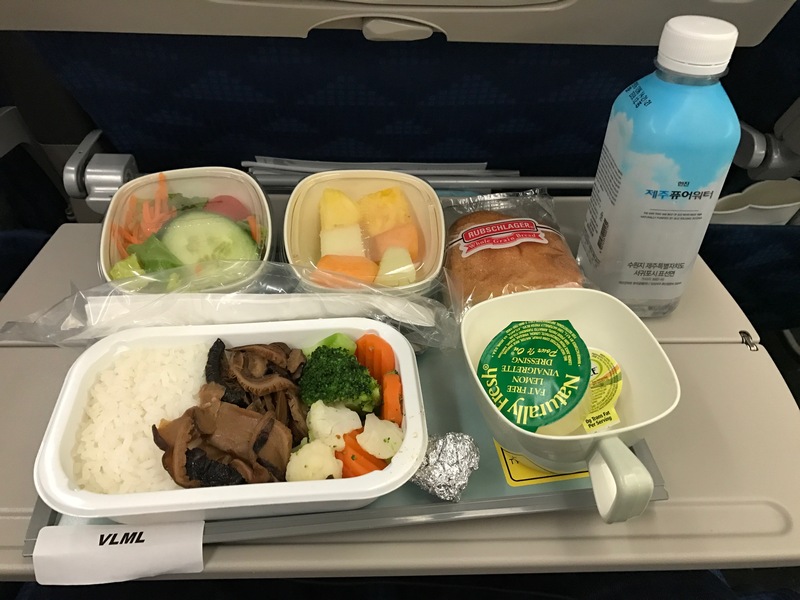 My second meal was rice with mushrooms, broccoli, cauliflower, and carrots accompanied by a salad and a roll; I skipped the broccoli. Grace’s second meal was a shrimp pasta. 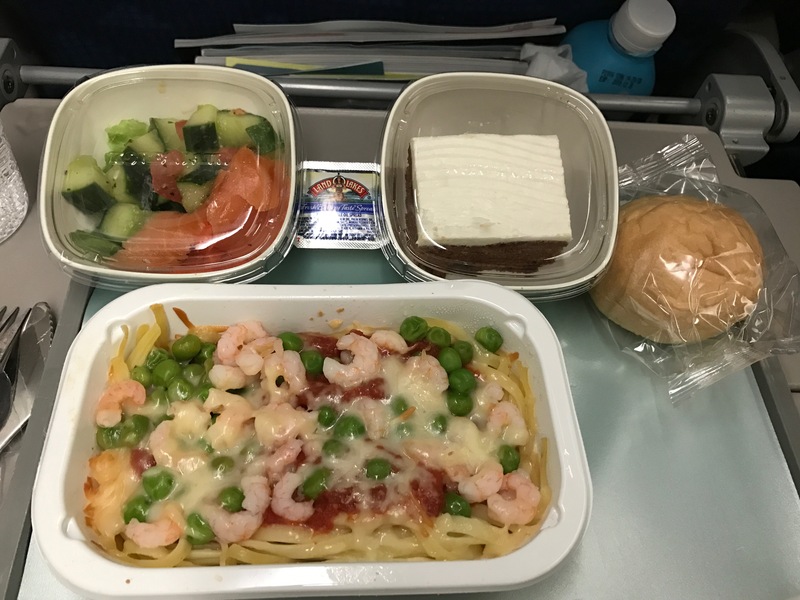 Sam’s first meal on the flight: vegetable pasta. On the flight, I watched Fantastic Beasts and Where to Find Them, which I thought was really good. I also watched La La Land for the second time and decided that I liked the music better this time around. Grace watched Manchester by the Sea, Jackie, and La La Land.